Alcoholism is a disease that eventually affects almost every part of your body, including parts of the brain that control your feelings, the way you make decisions, and the way you act or react with those around you. People with alcoholism have difficulty controlling how much they drink. So What Causes Alcoholism? And How Do I Know if I’m an Alcoholic? We don’t know for certain what causes alcoholism, or even if it’s caused by a single factor or multiple ones. We do know that people with alcoholic parents have a greater chance of getting the disease. Some doctors believe alcoholism may be related to the things we learn when we are growing up. It’s fairly accepted wisdom that alcoholism is not caused by a lack of will power or moral values. 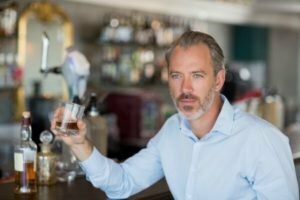 How to Determine if You Have Alcoholism? You may have a problem if you have tried to quit drinking, but were not able to stop. Alcoholism can make you do or say things you wouldn’t do if you were sober. Some of these things can hurt other people, even the people you love. Your doctor can help you find the right treatment program. You also can check with your health insurance company. But ask the right questions. Some insurance plans cover alcohol treatment only at certain places. At Into Action Recovery Centers we accept many insurance plans and will usually work with people who are committed to recovery. When you stop drinking, your body may find it hard with no alcohol. If you have been drinking a lot—it almost certainly will. You may also have some uncomfortable feelings. Those are just two of the effects of withdrawal. You may feel anxious and confused or have trouble sleeping, even if you cut back on your drinking. If you get “the shakes” when you don’t drink, or if you feel like you need to have a drink early in the day, you may need to take medicine when you stop drinking to help with the withdrawal. This is called detoxification. The key is, do not try to quit cold turkey. You should seek help from people who know what to do. Your doctor will likely ask you questions to see if you need to take medicine to stop drinking. It’s important to be honest with your doctor about how much you drink and the kinds of drugs you take. It may be tough to speak honestly, but do it. It’s not about pride or embarrassment—it’s about your life, and the lives of your loved ones. It’s not recommended. Attempting to detox yourself at home can be dangerous and life threatening. The best way to ensure that you detox safely is in a facility under the care of a physician and medical staff. Detoxification should be treated as a medical condition. It is not something to try cold turkey or with a “holistic” approach. When performed at a licensed facility, detox can be comfortable and relatively pain free, and you can be monitored closely for any medical complications that arise as a result of the process. Into Action Recovery Centers is a licensed facility that is equipped to help patients who need detox. Our medical staff will monitor you closely to ensure you don’t have any problems. Detoxification is not enough to treat alcoholism. You should have counseling before and after detoxification. Counseling will help keep you from drinking again. Remember, the physical addiction is only a part of the problem. Detox will treat that, but rehab is as much about treating the mental issues. Alcoholics Anonymous (AA), is a free support group for people with alcoholism. The people in AA help each other stay sober. Most communities have AA meetings, and most alcohol treatment programs tell their patients to go to these meetings. Where can I get more information to Answer the Question of How Do I Know if I’m an Alcoholic?